Netflix has aggressively been building its lineup of original programming over the last year or so, and coming up the network has plans to release another animated comedy. This week, the subscription streaming service released the first trailer for F is for Family, a brand new comedy featuring voicework from comedian and actor Bill Burr, Laura Dern, Justin Long and former American Idol contestant Haley Reinhart. Check out the profanity-filled and probably NSFW trailer, below. 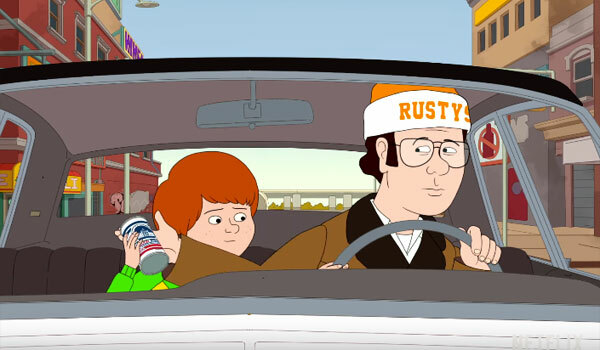 The trailer for F is for Family is filled with tons of blunt cursing, including an F-bomb from the Murphy’s teenaged son, Kevin. It’s also filled with a lot of nods to culture from the time the show is set. Mom’s become a working woman for the first time and this has affected the family’s food patterns, which now include frozen TV dinners. At one point, the blunt patriarch of the Murphy family, Frank, tells his daughter not to dream of being an astronaut because there are no female astronauts. Anyway, if you like your comedy to be politically correct, F is for Family is probably not for you. For others, the crass trailer will be a total delight. Period shows are all the rage right now, but we have to note that most of them are neither comedies nor animated programs, lending F is For Family a little bit of flavor when compared to the likes of Fargo, Vikings, Downton Abbey, Aquarius, The Americans and the recently-cancelled Wicked City. (Amazon, however, does has a pretty fun period comedy called Red Oaks, although it isn’t animated). F is for Family also broadens Netflix’s adult animated humor. So far, the streaming service has mostly made headway in the animated spectrum with children’s programming, a lot of it from DreamWorks Animation. Obviously, there’s also the adult animated program BoJack Horseman over at Netflix; that show has been successful enough that the company has announced a third season of the comedy that is expected to hit the airwaves in 2016. Fans will be getting the first season of F is for Family before the New Year. The new comedy will be available to bingewatch to your heart’s content starting on Friday, December 18 at 12:01 a.m. PT. You can check out some more of the streaming service’s upcoming premiere dates, here.